New interesting information about Bethesda's upcoming major title, Fallout 4 , emerges as the release date for the game is closing in. The game will be released November 11 2015 for Xbox One, Playstation 4, and PC. 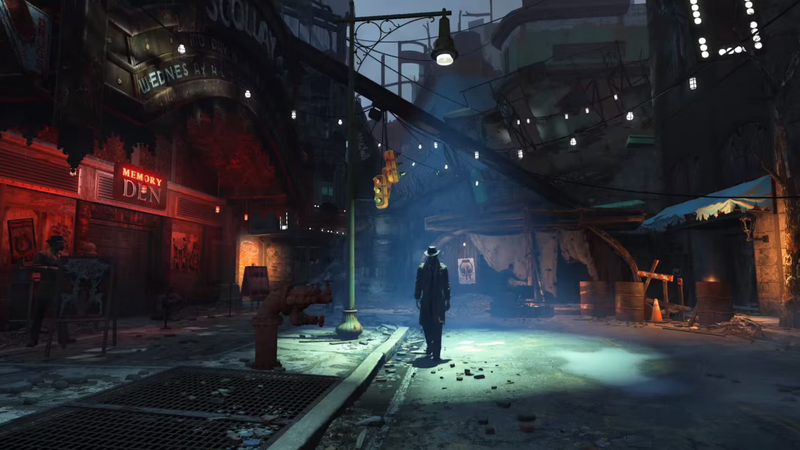 The sequel for Fallout 3 is only three months away. It's predecessor (FO3 by Bethesda) was mainly well received, the major complaints pointing towards abandoning the original style and game mechanics of the classic top-down adventure-RPGs Fallout 1 and 2, the original titles of the series developed by Interplay and Black Isle. On the other hand Fallout 3 was praised for extensive game-world, good action, and decent story - it was fun to play, though something totally different. The game was more of an action-RPG in 3D environment. Fallout 4 continues along the lines of it's predecessor, with upgraded game-engine (an upgraded version of Creation Engine used for ES: Skyrim) and mechanics. A fresh story and new post-nuclear game world to explore will be featured. Once again, you're a vault-survivor of the nuclear devastation - entering the post-nuclear game world from the depths of "Vault 111". If you've seen gameplay pictures of the game previously, you probably have noticed that Fallout 4 won't be graphically groundbreaking, but the big scale of it's size and plentiful of in-game events to enjoy will most certainly make up for it. It won't be the game to take full advantage of the new generation consoles (XBOX:O and PS) powerful hardware, at least graphically speaking. Yet the screenshots look "good enough". "To our fans who’ve asked: Fallout 4 doesn’t end when the main story is over and there is no level cap. You can keep playing and leveling." How repetitive the events will turn after 400 hours, or even 100, remains to be seen, though (editor's own thoughts)... but one thing's sure, there's certainly a lot of content in Fallout 4. Oh, and there won't be a set level-cap at all! "If you look at our previous stuff, it's kind of like that. We don't actually measure it like that. Because Skyrim is one size, but the mountains take up a lot of space. That's not really a game place, it's in your way, you have to go around it, so we're not really doing that [...] if you played Skyrim, I couldn't tell you it's X bigger, so we're just saying it's about the same size"
The game has seven (7) different stats (Strength, Perception, Endurance, Charisma, Agility and Luck - the S.P.E.C.I.A.L. -system), and behind each stat there will be set of perks set to that specific stat, which you can unlock according to the stat-points you spent on the actual stat. There are 70 perks all together, and each of them has several ranks. So with the ranks counted, there are 275 different different perks to unlock all together. 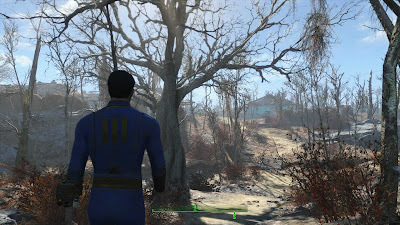 VATS -system has been changed a bit (or improved according to Bethesda), whereas previously you would pause the time to aim with VATS, at this time, entering VATS will slow down the time considerably, but not fully pausing the gameplay. The number of recruit-able companions has been set to twelve (12), plus to my understanding the dog which you can command, by the way, is on top of that, making the number actually to thirteen (13). The battles have been promised to be much more varying in size, featuring larger battles than ever before, with more participants. For example, there could be a three-way battle between Brotherhood of Steel, Ghouls, and Super Mutants (and you of course). There will be also massive in-depth crafting system Fallout 4, along with possibility to design your own house, or should one say "home-base", since you can actually add traps, terminals, and power grids into it to protect the house from attacks of Raiders. That's something pretty cool in my opinion, and I really hope that random events considering the defense of your own house are well designed. The house designer itself is similar to Elder Scrolls V: Skyrim's expansion called "Hearthfire", but has been upgraded and developed further with additional detail. Good stuff this far, although, the core of the game haven't been changed massively compared to it's prequel: Fallout 3. But by all the information known this far, it seems that the depth and customization of the game has been increased quite a bit. Personally, I myself still don't have the new generation console, but I'm rather interested in Fallout 4, so, I might just about to get it if a nice bundle comes for sale with Fallout 4 included. Probably the Playstation 4 . I'm not expecting the game to break any grounds, but it to be a nice entertainment for hundreds of hours to come. Fallout 3 was a fun game to play, afterall, so who wouldn't want more of the same in upgraded form?